The World of Wonder Conference in Chicago last week was simply fantastic! I got so much inspiration and so many ideas I can’t wait to share them here. It was also so wonder-ful to meet so many awesome people working everyday to keep humans and nature connected in so many unique, mindful, fun ways. 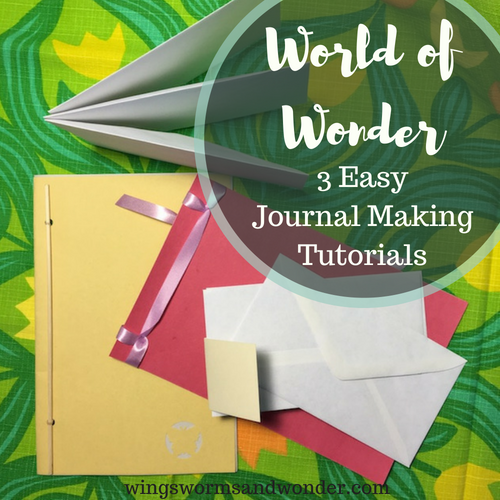 Since I know all of you couldn’t be there and some of you who were would find this useful too, I made videos for how to make the journals we made together in the workshop and a PDF download of the stick binding instructions. I also included the recipes for the sensorial activities as well! Now, let’s get to journal making! In a bowl or cup, add water to plain white flour a little at a time until you reach a milkshake consistency, mixing as you go along. This mix lasts up to a week in a sealed container in the fridge. Stir before using if it’s been a few days and if it smells of, it is. Submerge and soak lima beans in a bowl of water on the counter overnight or about 6-8 hours. You may need to add more water if the beans soak it all up. Drain the beans and store in a sealed container in the fridge until ready for use. Beans lasts up to a week in a sealed container in the fridge and if they smell off, they are. Download a PDF of the Nature Journal Stick Binding style: wings-worms-and-wonder-nature-journal-stick-binding . Thank you again to everyone who came out to my workshop at the WOW conference, Wondering and Wandering: Creative Nature Connection and Nature Journaling with Young Children. I hope everyone has a great time with these journals! How will you incorporate nature journaling into your early childhood (or any age) environment this coming year? Share pictures of your journal making and journaling adventures on Instagram #wingswormsandwonder so we can share your fun! Click here to get the full lesson plans for making the Seed Tapes and Bean Peeling (and nearly 100 more) in the book Wonder and Wander: An Early Childhood Nature Connection Guide. 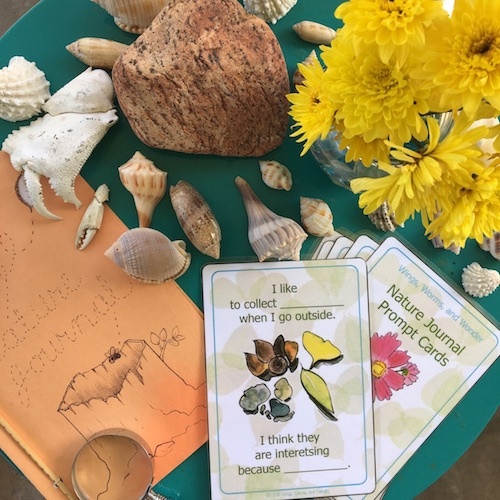 Want to learn more about using prompts in your nature journal lessons? 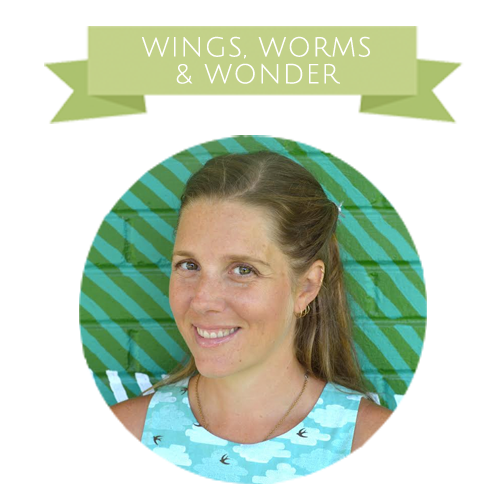 Check out my online course Using Nature Journal Prompts to learn more, get ideas, and download your own full illustrated set of the Wings, Worms, and Wonder Nature Journal Prompt Cards! Your work is really beautiful. I just wanted you to know in case you missed it, there is a misspelling on your cards above. Interesting is spelled wrong. Before teaching I was a graphic artist and I have done the same thing. It is like you look at it so much you sometimes miss the little things. Love your book! thanks! i couldn’t find it? could you say exactly where? Is it in the videos?